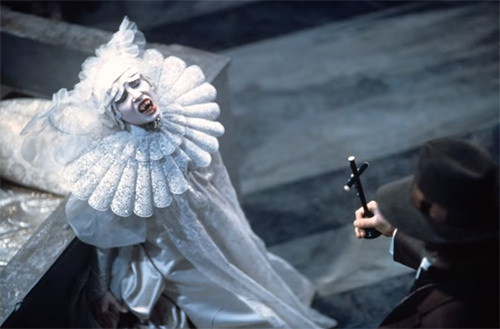 We continue to analyze the stage costumes of “Bram Stoker's Dracula”. 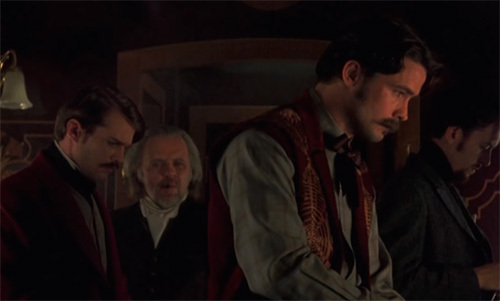 Every character in this movie – even the minor ones – has curios individual style and is dressed artfully. Of course, women’s costumes are more eccentric and beautiful. So, let’s see. 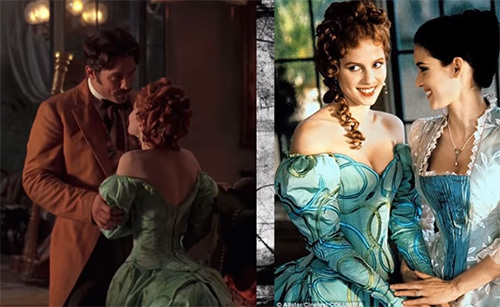 In this part, we’ll take a closer look at the stage costumes of Lucy Westenra, Dracula's brides, Jonathan Harker, Abraham Van Helsing, and the trio of Lucy’s suitors. 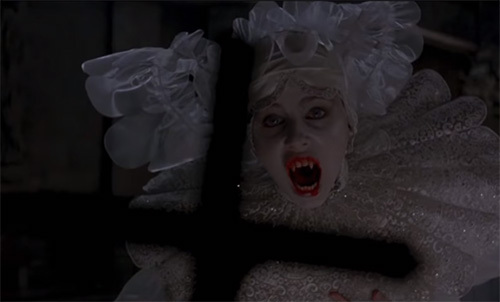 Lucy Westenra is the 19-year-old daughter of a wealthy family, and her costumes reflect her wealth and liberal sexual mores. 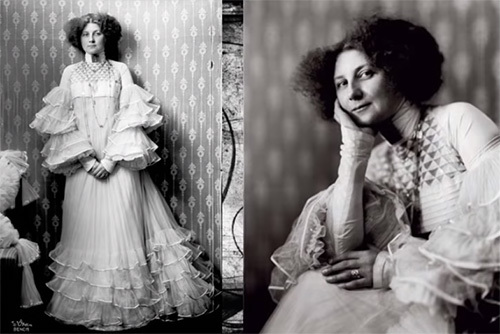 Her off-the-shoulder white gown reflects the Aesthetic Style, a period of dressing from 1850 to 1900. The typical fashionable aesthetic lady would have had red flowing hair (often henna enhanced), a pale face, green eyes, and she would have worn heelless shoes. 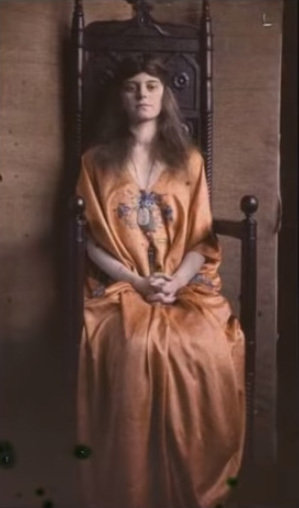 These women were considered to have loose morals and it did not help that many of the aesthetic women were thought slightly bohemian and beyond the normal social conventions and morals of the time. 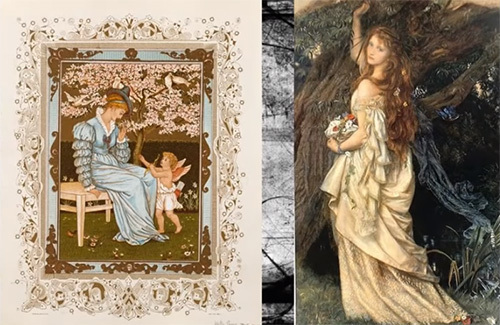 You can see this less structured style of dressing in this Walter Crane valentine card from about 1884 and in this Pre-Raphaelite art painting on the right by Arthur Hughes called “Ophelia” from 1865. Here is a close-up of the lace overlay, lined with pink fabric. As you can see on the right, this odd cage bustle is visible through Lucy's transparent gown. 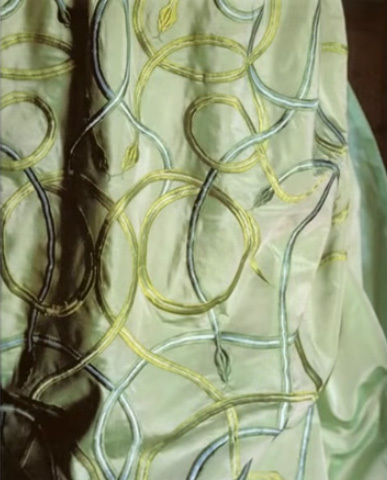 This peppermint green party dress was worn by Sadie Frost’s character Lucy. 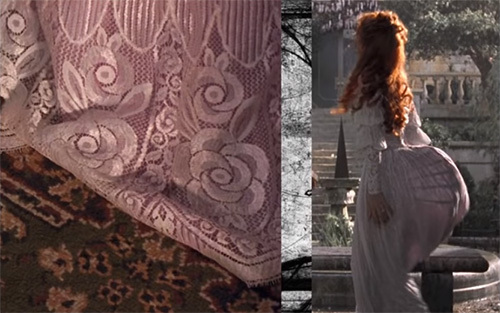 It's embroidered with intertwining snakes as a symbol of her character’s eroticism. Like her white gown, this dress is off-the-shoulder and plunging in the front and back in a style that was never seen during the 1890s. Here is a close-up of the finished gown. You can see the snakes here. 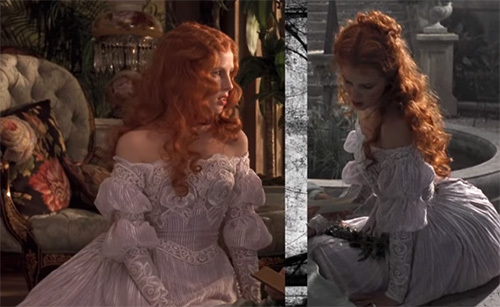 Using orange for the first time, Eiko chose this color for Lucy during this moonlight scene so that she would stand out dramatically in the dim light. 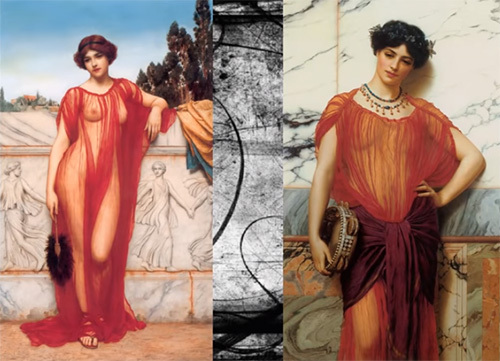 Channeling Lucy's sensuality, Eiko chose punchy and sheer fabrics for Lucy's costumes, like those depicted in the Neoclassical paintings by John William Godward “Athenais” from 1908 and “Drusilla” from 1906. During the storm, the diaphanous nature of the orange silk chiffon skirt and cape and Lucy's long red hair fly wildly during her sleepwalking state. Lucy's bedclothes are a series of silk organza and sparkle organza shapeless kaftans. These unstructured Bohemian nightgowns are similar to this aesthetic movement dressing gown from the early 1900s. 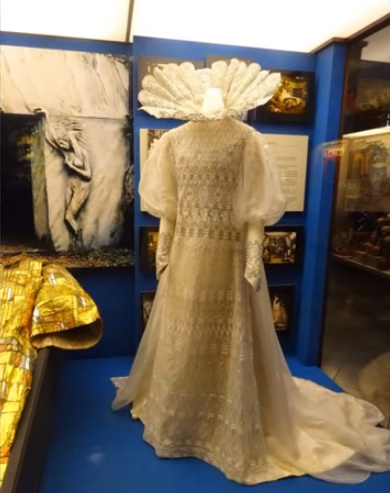 This is Lucy’s cozy wedding dress and what later becomes her burial costume. The wedding gown is also in the tradition of the aesthetic movement, like this Bohemian gown designed by Gustav Klimt and worn by Klimt’s muse and life companion Emilie Floege. 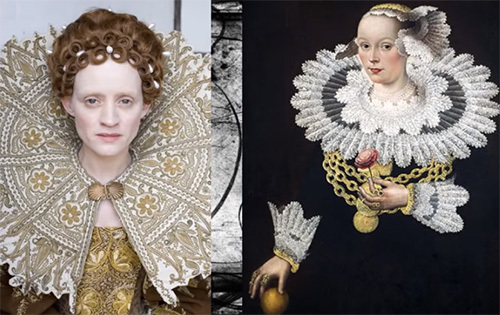 Meanwhile, the collar appears reminiscent of the Elizabethan ruff (seen here on the left) from the BBC production of “The Virgin Queen”. And on the right, this is Michael Conrad Hirt’s portrait from 1642. The headpiece also shares a close likeness. 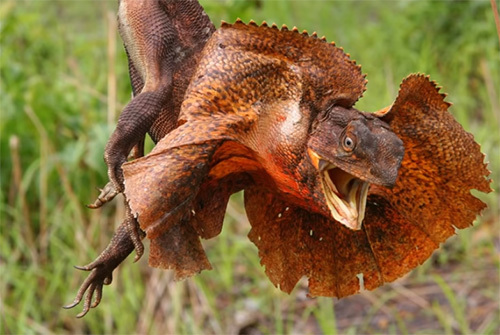 Eiko took inspiration from the Australian frilled lizard, a creature that unfurls the collar of skin when threatened. 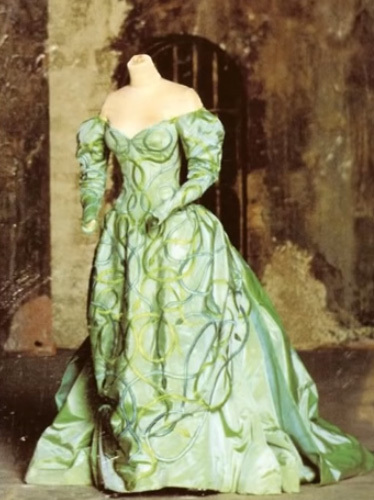 The cumbersome costume made it difficult for actor Sadie Frost to move in a lizard-like fashion, so instead of changing the costume – as Eiko had suggested – Coppola changed the choreography. 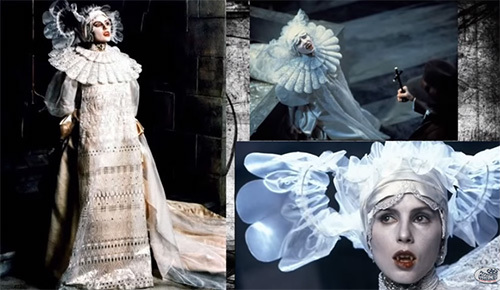 With the gown’s many layers of satin, organza, and lace and Sadie's ghost-like makeup (not to mention the striking contrast with the stage blood), the result made it one of the most memorable costumes in movie history. 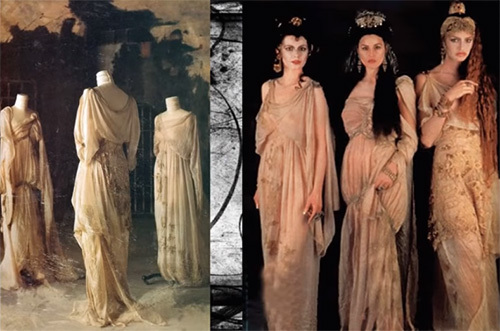 Dracula's three brides – or sisters, as they are sometimes called – are dressed in monochromatic classical Grecian-style gowns in stark contrast to Dracula's red dragon robe. Here are their gowns on display on the left and in a promo shot on the right. Stoker's brides resemble the lower world muses of Greek and Roman mythology. In Homer's “Odyssey”, the sirens lured nearby sailors with their enchanting music and voices to shipwreck on the rocky coast of their island. 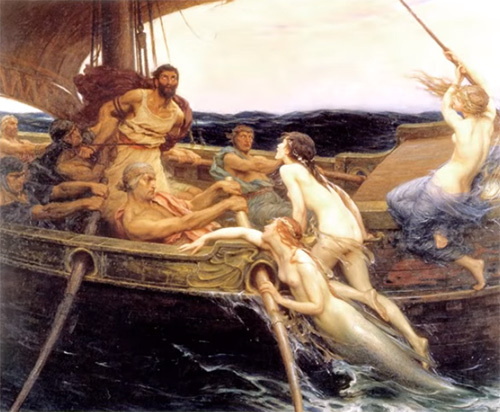 The Greeks featured the creatures as bird-like maidens, while the Romans (as seen here in the 1909 painting “Ulysses and the Sirens” by Herbert James Draper) depict the sirens as sea nymphs. Also from Greek mythology, the sisters might also be the three Gorgons and, like the sirens, are depicted in ancient Greek vase paintings and sculpture as winged women. 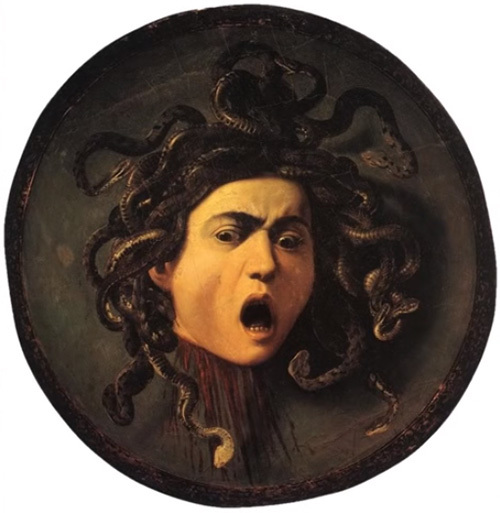 Medusa – the only mortal of the three – was humanized in late classical art with the face of a beautiful woman whose face was wreathed with coiling snakes. And, like Medusa, the brides would eventually have their heads cut off from their bodies. 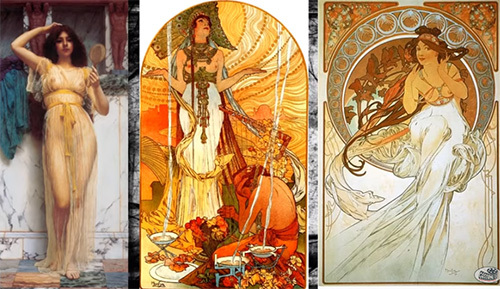 Eiko may have also taken inspiration from John William Godward paintings like “Girl with a Mirror” from 1892 or Alphonse Mucha’s work “Salambo” from 1896 and “Music” from 1898. The brides have elaborate wigs and jewelry with some Byzantine influences. 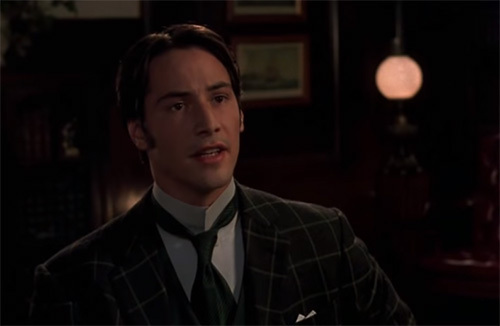 As an emerging solicitor, Jonathan dresses in sack suits, like this green windowpane ensemble. 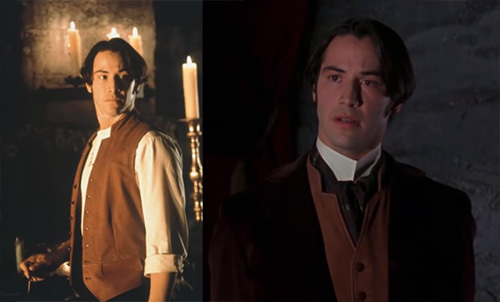 After Harker’s ordeal at Dracula's castle, Jonathan's hair turns prematurely gray. 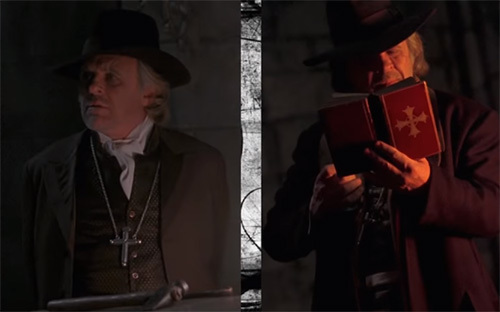 The Dutch doctor Professor Abraham Van Helsing comes to help with Lucy's obscure disease. 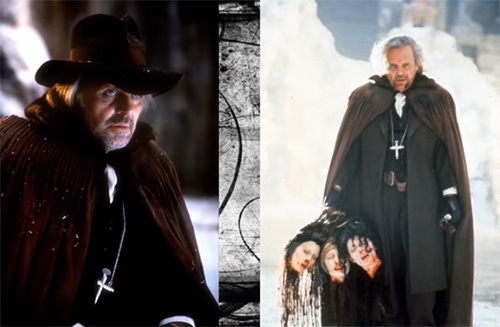 Van Helsing's clothing is in warmer golden and burgundy tones in contrast to Seward's muted academic clothing. His colors are bolder and in a slightly older style. Here he wears this beautiful cartridge-pleated cloak. It looks like something that would have been passed down to him for generations. He wears this cross as part of his uniform. Lucy has three suitors vying for her affection: Quincey Morris, Arthur Holmwood, and Dr. John Seward. Eiko created these three distinctive looks for the trio. 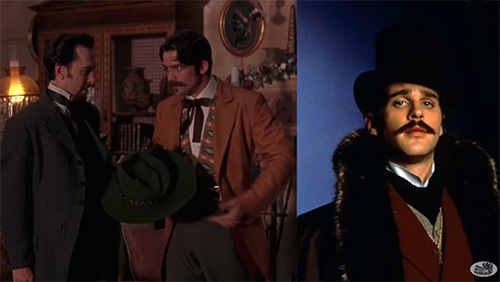 Being a wealthy Texan, Quincey is dressed in a cliche Old West “shoot-'em-up cowboy” Rhett-Butler look. He always carries a bone knife strapped to his belt. His vests and ties are always brightly colored and contrasted to the warmer hue of his jacket and trousers. 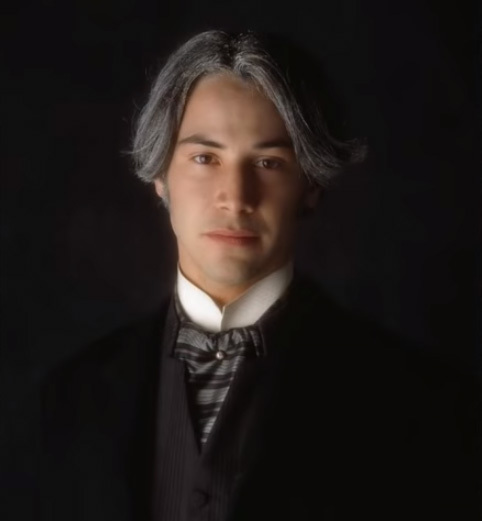 His look is finished up with a loosely tied cravat or string-tie. 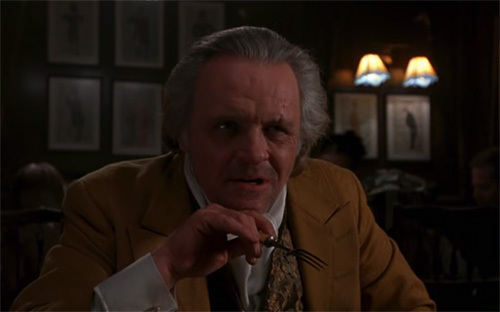 Dr. John Seward dresses for his profession as a psychiatrist at the local insane asylum. Like the academic that he is, his clothes are tweedy and practical. 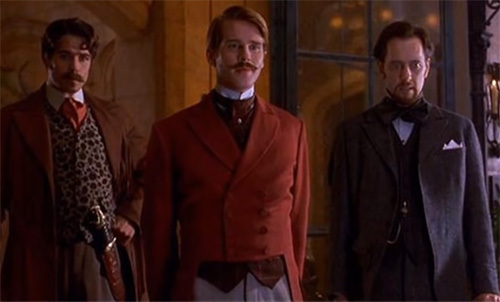 Lucy's eventual fiancee Arthur Holmwood, as the son of a British Lord and being from old money, dresses in finery. His clothes are showing his class and station in life. As an example of how Eiko bends the time period, Arthur's tailcoat is about 50 years at a fashion by this point.